As libraries change to meet the evolving needs of our patrons, including the development of online services, many libraries are considering consolidating physical service points to maximize staff and better serve the in-house patron. 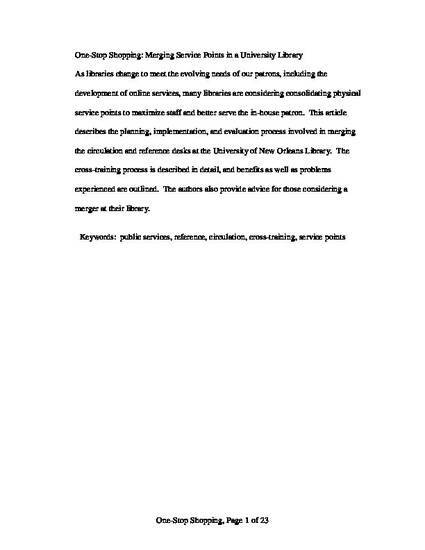 This article describes the planning, implementation, and evaluation process involved in merging the circulation and reference desks at the University of New Orleans Library. The cross-training process is described in detail, and benefits as well as problems experienced are outlined. The authors also provide advice for those considering a merger at their library. Published in Public Services Quarterly 4 (1) (2008): 29-45. Crane, Janet and Pavy, Jeanne A., "One-Stop Shopping: Merging Service Points in a University Library" Public Services Quarterly 4 (1) (2008): 29-45.